One of my favorite parts of the internet these days is the abundance of food blogs. At this point, I use Pinterest almost exclusively as an online cookbook, finding 90% of my new favorite recipes there, and there alone. (Feel free to follow my food board, if you're into that sort of thing!) Finding new recipes online feels a bit more foolproof than trying something out of a hold-it-in-my-hot-little-hands cookbook. I love finding a blog with beautiful photography, step-by-step details, a little backstory and witty banter within each post, and a bunch of comments with feedback from people who have actually tried the recipe. There have been very few recipes I've tried that weren't hits, to be honest. In any case, I thought I'd compile a list of my six favorite muffin recipes and share them with you! These recipes are ones I've made over and over again, so I stand behind their deliciousness (and freezability, because goodness knows one always needs muffins in the freezer for a rainy day). There are a couple recipes I've made a few little tweaks to here and there (which makes me feel fancy, which is nice because when it comes to the kitchen, I'm decidedly not), and I'll be sure to note any changes I've made, if any. Oh, these muffins. They taste as good as they look. When Cora was first born, I did a random Pinterest search for a blueberry muffin recipe in the wee hours of the morn, and this is the one I chose to try. Since then, I've made them quite a few times and can't get enough. They were so quick to whip up, they were loved by everyone in our family, and they turn out beautifully every single time. They are so delicious, they rarely last around here for long. 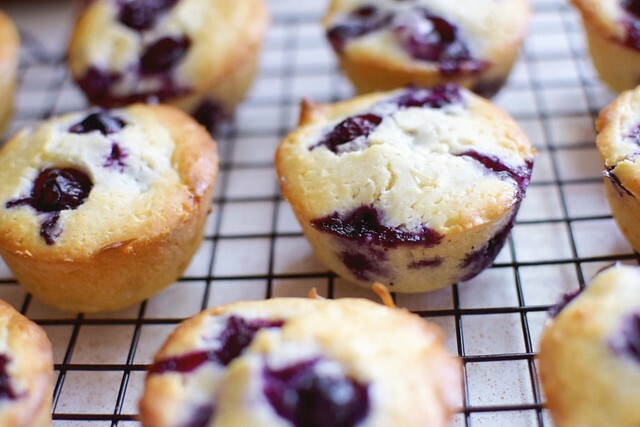 The recipe uses sour cream to make the muffin a bit more dense and moist—similar to poundcake. I've made these with both frozen and fresh blueberries and they turn out perfectly either way. Tip: I have recently been trying to switch to coconut oil for baking, and now use that instead of vegetable oil for this recipe. Still delicious; still eating three in one day. Amen. I first made these muffins a few years ago, and to this day this is my go-to recipe when I have over-ripe bananas. (Actually, there are times I purposely let bananas get all spotty because I have a craving for these muffins. If you ever see terrifying bananas on our counter, odds are I have some baking in my immediate future. Or maybe I started thinking I could be super healthy and eat one banana every day and bought too many bananas at Costco and am filled with regret.) This recipe calls for nuts, but adding nuts to any sort of muffin/cookie/brownie is not my cup of tea, so I usually just throw in a few more chocolate chips and call it a day. Tip: I often freeze half the batch, then thaw them in the fridge whenever we are ready for more. This year, I realized I needed to find more healthy-ish muffin recipes and decided to search for one that featured zucchini as a main ingredient. My husband gives zucchini the stink-eye, but my older daughter and I kind of love it, and we both love these muffins. (Jay is missing out. Someone else needs to tell him this so he will believe it.) These muffins are filled with good things (zucchini, oats, coconut oil) and are sweetened without sugar (this is where you head to Costco and buy real maple syrup). Tip: If you don't have the full amount of zucchini, you can always throw in some grated carrot and this recipe still works just fine. I had to do that once, and kind of wanted to do it on purpose the next time around. Also, I think these are best eaten within a couple days, or frozen right away and thawed whenever you want a few ready to eat. These muffins are a bit different, since they don't have any flour and instead use oatmeal as the main ingredient. The idea behind these is essentially to find a way to have oatmeal for breakfast when you're in a rush or want something a bit more convenient than having to actually make a pot of oatmeal. I ate a ton of these when Cora was a newborn, because I always wanted a hot breakfast but hadn't quite mastered the art of mornings (without madness). I loved having these ready in the fridge to eat cold, or to pop in the microwave for 15-ish seconds to heat up. These are incredibly delicious, and with the chocolate chips they definitely feel like a treat. Tip: I use coconut oil for this recipe instead of vegetable oil, and it works well to melt the coconut oil first, then mix into the pumpkin puree (at room temperature) before adding anything else. That way, the coconut oil doesn't clump up when you mix it with the cold ingredients and make you all angry. This list would not be complete without my childhood favorite! My mom made these every autumn and to this day they give me those warm, fuzzy feelings of home. One look at the recipe and you'll see these are definitely an indulgence (hello, oil and sugar) but honestly, sometimes a muffin should be just that! Plus, this recipe makes a ton of muffins, and one batch is usually able to get me a couple dozen or so mini-muffins and one dozen full-size muffins. They freeze great and are always a hit when I bring them to share with others. This year I'd like to try using coconut oil instead of vegetable oil (or perhaps a 50/50 mix, since the recipe calls for so much) and I'll keep you posted on how that goes! Tip: Instead of cinnamon, I like to use pumpkin pie spice, when I have it on hand. Now it's your turn to share your favorites! Give me all the muffin recipes. Please and thank you.